Buffer zones may serve a wide range of purposes covering from environmental to socioeconomic and military issues, but here the focus is on the use of buffer zones for environmental protection purposes. Basically, an environ mental buffer zone serves the purpose of changing an environmental pressure and, thus, effect occurring in a recipient adjacent to the zone. Therefore, buffer zones are closely connected to environmental problems of a site specific nature. To support the policy choices an ex ante evaluation of different options should be performed, and the imple mentation should be followed by an ex post evaluation to evaluate the fulfillment of the policy target. Establishment of buffer zones in this article is seen as a policy strategy applied to realize a pre specified environmental objec tive; thus, focus here is on issues 2 and 3. As apparent from the two examples the specific loca tion of the zone is of importance. The simplest way to designate the zone is to appoint an area within a certain distance of the targeted location. However, natural con ditions such as soil types, slopes, and the dominant wind direction (in case of airborne pollution) may be relevant to take into consideration when appointing the zones. This implies that more complex criteria for appointing the zone may be efficient. One example could be to design a buffer zone dependent on the wind direction frequency if the aim is to reduce ammonia depositions to specific nature locations. Another example could be varying the width of riparian buffer zones depending upon the erosion potential of the adjacent fields. The regulation applied within the buffer zone can either be mandatory, flexible, or voluntary. In the case of a mandatory regulation, this will typically consist of prohi bition or restrictions on the activities within the zone. This implies that land owners within the zone are subject to limitations in the property rights or - more far reaching -are obliged to carry out certain nature preservation. One example is the National Danish Nature Protection Act that requires land use to be unchanged within designated locations characterized by specific nature types. schemes within the designated buffer zones. The scheme may either provide the landowners with the opportunity to enter subsidy payments targeted at reducing environ mental pressures within the buffer zone, for example, reduced pesticide use, or simply provision of advisory services targeted to landowners within the zone. Mandatory, flexible, and voluntary regulation can of course also be applied in various combinations. One example could be ammonia buffer zones where farmers are faced with a mandatory requirement of reducing ammonia emissions to a prespecified level, but at the same time are eligible to apply for subsidies to imple menting ammonia abatement technologies. On 1 January 2007 a new integrated environmental accreditation scheme for all livestock farms was passed in Denmark. According to this scheme all farms with more than 75 animal units (one animal unit correspond to the nitrate production of one jersey cow) have to be approved based on their extra loss of nutrients when applying for an increase of the number of animal units. The integrated approach means that all environmental emissions have to be considered in the application including ammonia emissions from the stables and man ure containers. 1. Buffer zone I. If just one of new or modified stable or manure container of the farm is situated less than 300 m from the vulnerable area no increased emission is approved. 3. Outside the buffer zones. 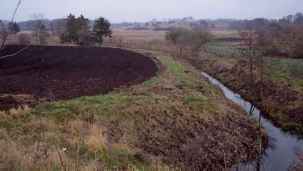 No individual regulation of the ammonia emissions from the farms under environ mental approval. The nitrogen vulnerable areas were pointed out by a national committee (Wilhjelm udvalget). Afterwards the areas were adopted as part of the third Aquatic Action Plan, and the regulation related to the ammonia buffer zones was implemented as part of the new law on envir onmental approval of livestock farms as the primary basis for the individual regulation of ammonia emissions. Pesticide free buffer zones needed. Furthermore, in order to reduce the administra tive burdens and to ensure the quality of the applications all environmental calculations (including ammonia emis sion calculations) and other information needed for the application for an integrated environmental approval are integrated in a new internet based digital application system (www.husdyrgodkendelse.dk). 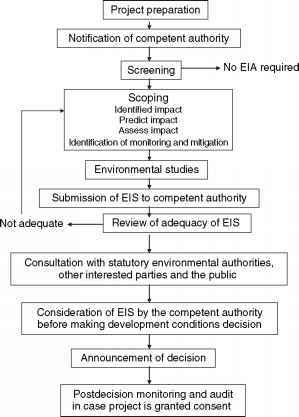 See also: Environmental Impact Assessment and Application - Part 1; Landscape Planning. Clarke AE, Wolf TM, Kuchnicki TC, Francois DL, Glaser JD, and Hodge VA (2004) Use of buffer zones for the protection of environmental habitats in Canada. Aspects of Applied Biology 71(1): 133 139. Ducros CMJ and Joyce CB (2003) Field based evaluation tool for riparian buffer zones in agricultural catchments. Environmental Management 32(2): 252 267. Hickey MBC and Doran B (2004) A review of the efficiency of buffer strips for the maintenance and enhancement of riparian ecosystems. Water Quality Research Journal of Canada 39(3): 311 317. Roe JH and Georges A (2007) Heterogeneous wetland complexes, buffer zones, and travel corridors: Landscape management for freshwater reptiles. Biological Conservation 135(1): 67 76. Schou JS, Tybirk K, Hertel O, and L0fstr0m P (2006) Economic and environmental analysis of buffer zones to reduce ammonia loads to nature areas. Land Use Policy 23: 533 541. Viaud V, Merot P, and Baudry J (2004) Hydrochemical buffer assessment in agricultural landscapes: From local to catchment scale. Environmental Management 34(4): 559 573.